Dr. Anahita Jamshidnejad (Delft University of Technology) received the 1st Prize for the 2018 IEEE Intelligent Transportation Systems Society Best PhD Dissertation Award. Prof. Markos Papageorgiou was a co-supervisor of her PhD thesis. Prof. Markos Papageorgiou was selected IEEE Life Fellow. Maria Kontorinaki, a former PhD student within TRAMAN21, was elected Lecturer in Operations Research in the Department of Statistics and Operations Research within the Faculty of Science at the University of Malta. Maria has been a member of the Dynamic Systems and Simulation Laboratory from 2012 to September 2017. Since October 2017 she has been a post-doctoral researcher at KIOS Research and Innovation Center of Excellence, Nicosia, Cyprus. The paper by Spiliopoulou, A., Perraki, G., Papageorgiou, M., Roncoli, C.: “Exploitation of ACC systems towards improved traffic flow efficiency on motorways”, which was presented at the 5th IEEE International Conference on Models and Technologies for Intelligent Transportation Systems (MT-ITS 2017), Naples, Italy, June 26-28, 2017, was selected as the "Best paper presented by a woman". The paper by Spiliopoulou, A., Papageorgiou, M., Herrera, J.C., Muñoz, J.C. “Real-time merging traffic control at congested freeway off-ramp areas”, which was presented at the Transportation Research Board (TRB)’s 95th Annual Meeting in January 2016, was selected as the "Best Freeway Operations Paper in 2016" by the Freeway Operations Committee. A corresponding Award was presented at the 96th TRB Meeting in Washington, D.C., on 10 January 2017. Dr. Claudio Roncoli was elected Assistant Professor at the University of Aalto (Finland) and will start under his new position on October 1, 2016. In a bibliographic analysis of highly cited papers on Intelligent Transportation Systems (ITS), published in IEEE Trans. on Intelligent Transportation Systems in April 2016 (LINK), M. Papageorgiou and A. Kotsialos were included among the top-10 most productive authors of ITS h-classic documents with 2 (out of a total of 53) h-classic papers. As a consequence, Technical University of Crete was included in the top-10 of institutions with most ITS h-classic documents. The IEEE Intelligent Transportation Systems Magazine (vol. 7, No. 3, 2015, pp. 82-85) published an article dedicated to the Dynamic Systems and Simulation Laboratory. The paper by L. Faulkner, F. Dekker, D. Gyles, I. Papamichail, and M. Papageorgiou, "Evaluation of HERO Coordinated Ramp Metering Installation at the M1/M3 Freeway in Queensland, Australia", which was presented at the Transportation Research Board (TRB)’s 93th Annual Meeting in January 2014, was selected as the "Best Freeway Operations Paper in 2014" by the Freeway Operations Committee. A corresponding Award was presented at the 94th TRB Meeting in Washington, D.C., on 13 January 2015. Prof. Markos Papageorgiou received a Research Excellence Award by the Technical University of Crete; the award was presented to him by the President of the University on 5 December 2014 (LINK). The article by M. Papageorgiou and A. Kotsialos, "Freeway ramp metering: an overview", IEEE Transactions on Intelligent Transportation Systems, vol. 3, no. 4, pp. 271–281, December 2002, won an award as one of the top 3 Best Survey Papers in the decade 2000-2009 in the journal (http://ieeexplore.ieee.org/stamp/stamp.jsp?tp=&arnumber=6585827). The article by Papageorgiou, M., Hadj-Salem, H., Blosseville, J.-M. “ALINEA: a local feedback control law for on-ramp metering”, published in Transportation Research Record 1320 (1991), pp. 58-64, is the most cited paper in the history of the TRB Committee on Traffic Flow Theory & Characteristics (TFTC). On the occasion, TFTC has organised a special webinar “to feature Prof. Markos Papageorgiou as one of the most influential authors of traffic flow theory and for his lifetime achievements”. A corresponding Award was presented in a “Highest Cited Paper Ceremony Honoring Markos Papageorgiou” at the 93rd TRB Meeting in Washington, D.C., on 14 January 2014. 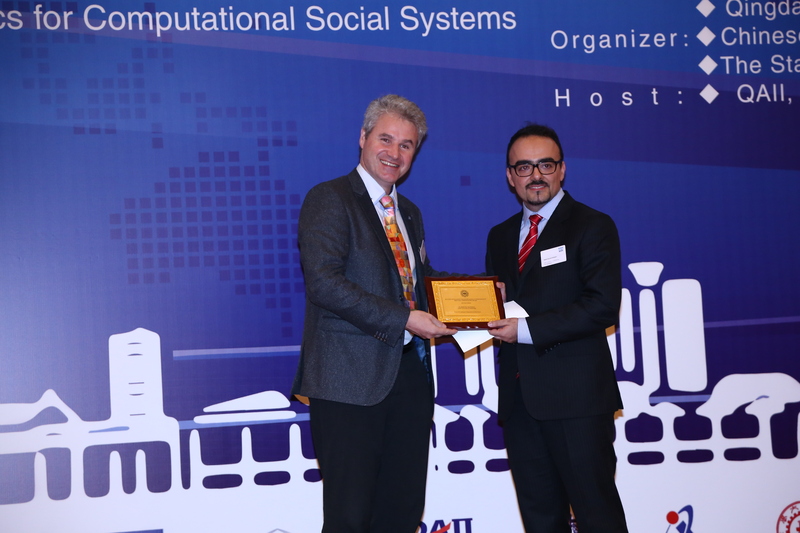 Prof. Markos Papageorgiou was elected Fellow of IFAC (International Federation of Automatic Control) in July 2013 "for seminal contributions to modelling, control and optimization of transport systems and water networks". The Fellow certificate and pin will be presented in the framework of a forthcoming IFAC event.